Netminder Janis Auzins was in great form for Phantoms in Telford. It is probably safe to assume Peterborough Phantoms’ bad run is over. Not so long ago, the city team had lost six of seven league games and were in danger of disappearing down into the murky depths of mid-table in the English Premier League. Darius Pliskauskas was back in form for Phantoms at Telford. So what better way to turn things round than four wins, of varying significance and quality, and in two different competitions, in the space of a week? It means Phantoms are safely through to a cup final and homing in again on the EPL summit. They’re back within five points of leaders Basingstoke thanks to a fine 5-2 success in Telford last night (January 24). It is also probably safe to assume Slava Koulikov and his men rather enjoy their trips to Shropshire. Their three visits this season have yielded five points with two victories and an overtime reverse. It is an envious record which few other teams will come close to despite the reigning champions’ admittedly below-par defence of their title crown. Koulikov said: “We have managed to find a way to win in Telford. We did it last season and we had already done it this season. “We knew we could get the points again and the guys delivered even though it wasn’t one of our very best performances. “Not many teams will achieve anything close to five points in Telford and it was also nice to keep building momentum at the end of a good week. Their latest victory certainly wasn’t a cakewalk though despite an ultimately comfortable scoreline. Phantoms fell behind early on to a strike from Tigers import Blahoslav Novak and were reliant on some expert netminding from Janis Auzins to prevent the deficit increasing. Milan Baranyk briefly pulled Phantoms onto level terms when following up a first-period fight (he dropped the gloves with Joe Miller) with an unassisted goal. The only thing missing for the Czech ace was an assist to complete a Gordie Howe hat-trick. Phantoms were behind again seconds before the mid-point of the match to a Max Birbraer effort, but they turned a narrow deficit into an advantage in the remainder of the middle session. Captain James Ferrara, who reverted to a forward role after several recent outings with defensive duties, provided the second leveller before back-on-song Darius Pliskauskas put them ahead. And a third-period brace from leading scorer Ales Padelek ensured Phantoms pocketed two pleasing points. The Czech forward struck on a powerplay before completing the scoring by firing into the empty net after Telford had pulled netminder Thomas Murdy for the final couple of minutes. 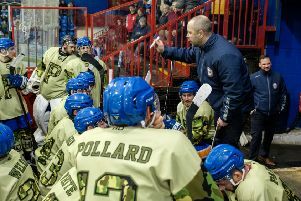 Coach Koulikov added: “Janis kept us in the game in the first period when Telford were ahead and threatening to increase their lead. “The other boys fed off him, got some positive energy going and went on to win the game. Phantoms now go from one of their happiest hunting grounds to one where they have so far failed to prosper. A final trip of the season to Hull to take on the second-bottom Pirates is next on the agenda on Saturday (January 30) ahead of a home clash against Guildford at Planet Ice on Sunday (January 31).